Preferred Properties Landscaping & Masonry: Sanjuan Fiberglass Pools, Spas, Water Features & more! Preferred Properties Landscaping went to pool school for the winter. In the past 20 years, Preferred Properties provided our design abilities and creativity to other pool builders, enabling them to deliver a backyard oasis to customers. Preferred personally assisted homeowners with building concepts and integrated these with the pool builder of their choice. We have had the opportunity to work with the area's best pool builders providing pool coping, pool decking, grading, water features, poolscapes and more. Preferred was often the initiator of a project, the concept creator and a leader throughout the project. Preferred's team closely supervises all facets of the project, ensuring that expectations are met. With a passionate leader from Preferred on your team, unforeseen hurdles may be handled without your noticing or interrupting the project (i.e. drainage and run-off of water on the project, fencing strategies, how the yard will function when the pool is closed). Many of our award winning projects and "outdoor living concepts" can be seen in portfolios of local Pool builders. We are proud to be an award winning industry leader in residential design build firms helping customers and pool builders create the poolscapes of their dreams. Our experience has led us to become builders of San Juan Pools. 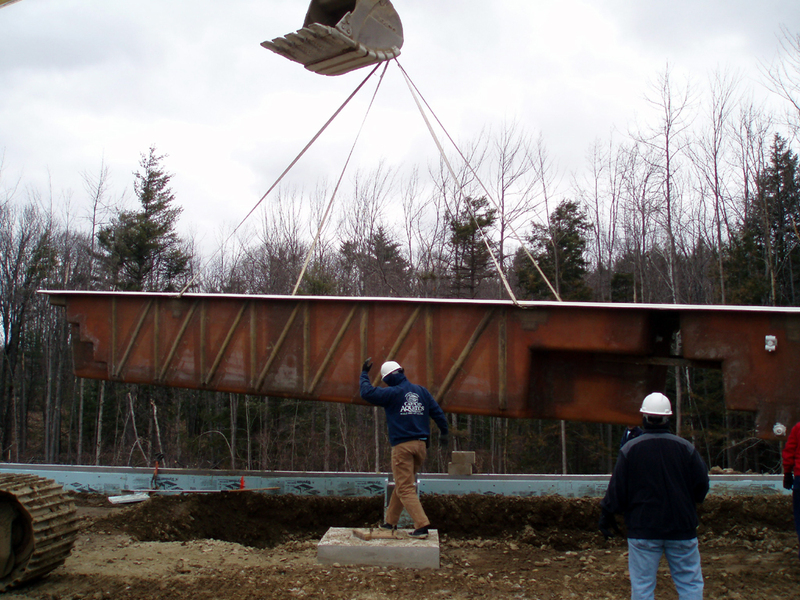 Over the years we have created and upheld a level of excellence in the backyards of many Connecticut residences. Our expertise and flair delivers a "WOW" factor. We create an area for families to call their own, extending their living beyond the walls of their homes to an outdoor OASIS. The San Juan pool manufacturers took us under their wing, making sure we are fully equipped and competent to deliver the San Juan fiberglass pool of your dreams. We provide all the attributes of the back yard Oasis and a living investment built to the highest standards. This is why Preferred has chosen SAN JUAN POOLS. San Juan Pools are built to the highest standards, much like the high standards, expectations and craftsmanship of Preferred. Preferred provides a trustworthy design build leader to carry you from concept to completion. The benefits of a single project leader include coordinating labor and material schedules, reducing cost over runs, and avoiding problems not readily visible without an experienced team and project manager. Owning A fiberglass pool is the best value for New England homeowners. 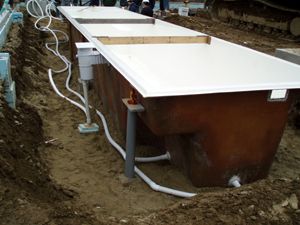 Fiberglass pools are neat, clean and efficient to install. Fiberglass has many positive aspects including durability and flexural strength 17 times stronger than concrete. 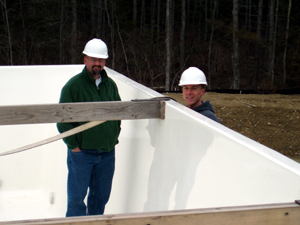 The fiberglass shell's 25 year warranty takes the freezing and thawing conditions of New England's winter wrath into account. 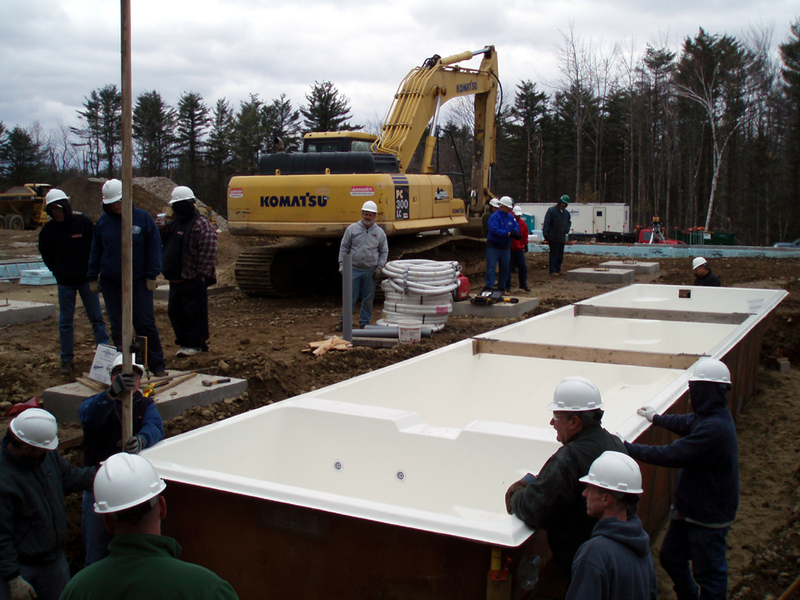 Unlike conventional concrete and liner pools, fiberglass pools do not require liner changes or concrete plastering. Fiberglass pools deliver the simple pleasures of swimming at its best. Preferred is pleased to offer San Juan's 65 different pool configurations and in ground spas, providing endless design opportunities. Vacation in your own backyard with a San Juan Fiberglass Swimming Pool! "Getting away from it all" can be as easy as walking out your back door. Fiberglass swimming pools are low-maintenance requiring little time for cleaning and maintenance. Simply enjoy family time during your days and evenings as you float, swim, play and relax in your San Juan Fiberglas Pool from Preferred Properties Landscaping. We have many different sizes and shapes of pools to choose from. Our pools feature built-in steps and seating, and optional jets for therapeutic massage. Fiberglass pools feature a durable, satin-smooth, stain-resistant finish that is easy to maintain and require substantially fewer chemicals than other types of pools. Fiberglass pools never need to be acid washed or resurfaced. San Juan has also developed a new interactive CD which allows you to be more involved in the design of your backyard pool. It’s fun, fast and easy and allows you to see how your pool area will look. You select the San Juan Fiberglass pool that's right for your family and yard using simple tools to change the size, shape and location of the pool. The software also allows you to change the vegetation, decking and furniture around your new pool. It's so easy, you won't even need your kids help! Just click on "Contact Us" and we’ll rush a copy to you today with no obligation. See the many advantages of owning a San Juan Fiberglass Swimming Pool as you explore our web site, and discover what an excellent investment it brings to for your home and family. For additional information visit Sanjuan Pools website at www.Sanjuanpools.com. Call us today for your FREE in-home estimate!